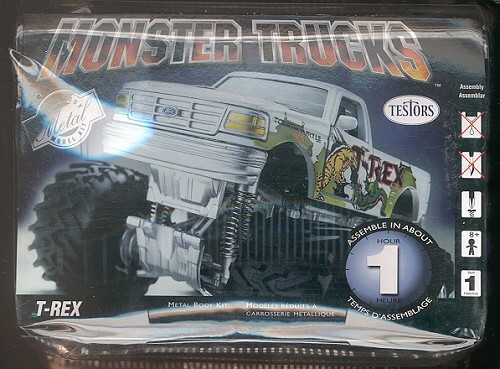 For several decades, the phenomenon of 'monster trucks' has been a huge hit at fairs and events across the US. These are basically pick-up truck or panel wagon truck bodies draped over specially designed chassis. They are generally powered by the largest engine that the owner can afford, sometimes cr anking out 3,000 or more horsepower. The general design of the chassis is four wheel drive as they use gigantic wheels and tires that would look more at home on a combine or large tractor than on a truck. In order to accomodate these huge tires, the body of the truck is elevated so high in the air, that often times a ladder is needed to enter the cab. Competitions are held between two vehicles in a similar format to a drag race. They are lined up side by side and the first to the finish line, often only a hundred meters away, is the winner. However, it isn't as simple as it seems, for between the start and finish are generally a row of crunched automobiles. These trucks have to run over these cars in order to get to the end. Generally, they launch themselves into the air at the first car, crashing down on the rest before continuing to the end. 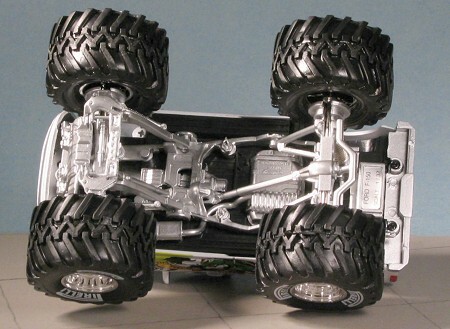 A perfect landing is requires or these top-heavy beasts will roll over or break an axle, ruining the driver's opportunity for the next round. By no means a sport of finesse, it is still extremely popular with many segments of society, especially those of us who just like to hear the roar of big engines! 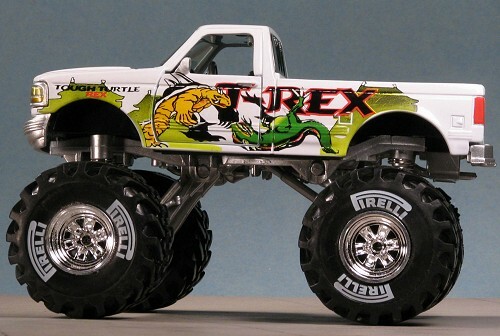 It is a fact of the industry that the majority of modelers build cars and trucks. I've seen estimates for as high as 60% and judging by the amount of shelf space given to this genre in general hobby stores, I can believe it. Face it, not everyone can touch an F-15 let alone fly in one, but for cars and trucks, this isn't the case. 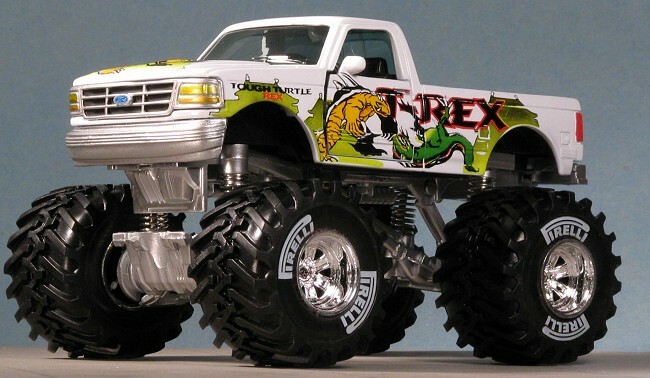 In fact, many build models of vehicles they have owned. This and the seemingly unlimited ability to customize these models is what makes them so popular. Also in the more recent years, model kits themselves have undergone a decline. It seems that the pace of life is such that some just don't seem to want to take the time to even build a model. Into this gap has come the die-cast. Most often, these are already built so all one has to do is plunk down the bucks and put it on a shelf. Not very satisfying for myself and a lot of others. In an attempt to put some construction into things, companies such as Testors have gone to a sort of kit form. In this the major components are already painted as needed and the builder simply screws together, or snaps in place the parts. Still not much in terms of model building, but better than just buying a ready to go car. Testors kit comes attractively packaged so that you can see most all the bits through the clear package. After opening the blister container, the parts fall out onto the surface and we can get a good look at them. 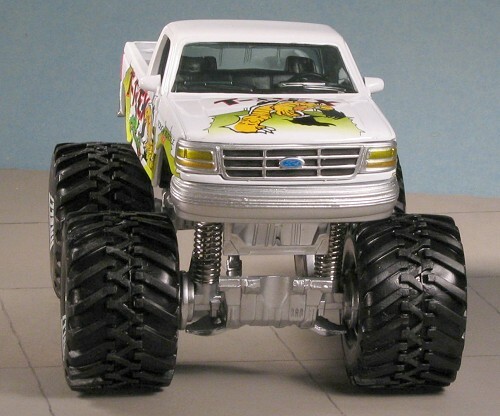 Basically, there are four tire/wheels, a body, the chassis, the interior, the bed and the rear bumper. A small bag contains the two axles, three screws and a screwdriver. The instructions are on the back side of the header card. There are 9 photo construction steps showing how the vehicle is assembled. Obviously thinking that 9 steps and a multitude of bits are too much for the buyer, 4 of the steps are unnecessary as those parts have already been pre-assembled by the nice folks in China where this kit is produced. Removing all the pieces from the pack, I scanned things to see just what was needed. The only tools I had to get were a hammer. First, I inserted the axles into a wheel and using a hammer, pounded them into place. I used a wood block under the wheel to help prevent damage and used another atop the axle so I'd have something large to hit. Once in place, I threaded the axle through the chassis and resumed pounding. This took probably 7-8 minutes total as the axle really has quite a ways to go before it is fully seated. Then, I inserted the interior, then the truck bed. 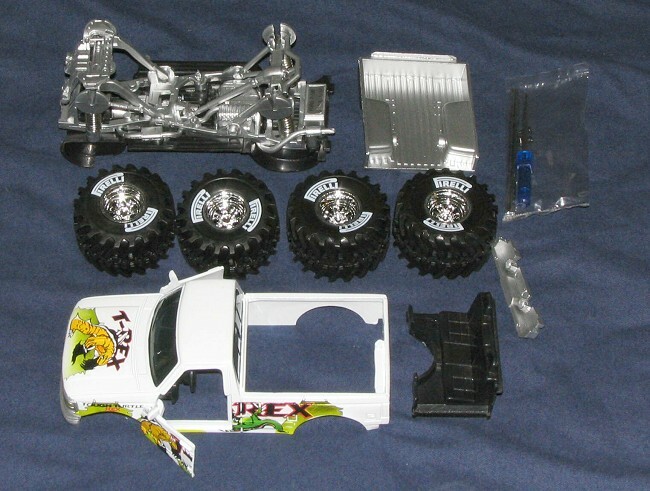 The chassis (which, by the way, is nicely sprung so that the truck will actually compress the springs when you play with it), was set into the body. The front screw was then installed. Be careful not to over-tighten these screws or you'll strip them out. Finally, the rear bumper was put in place and the two screws that hold it in were tightened. Truck finished. Total time, about 15 minutes. Undoubtedly one of the fastest builds I've ever done. Actually, I could just leave it there. 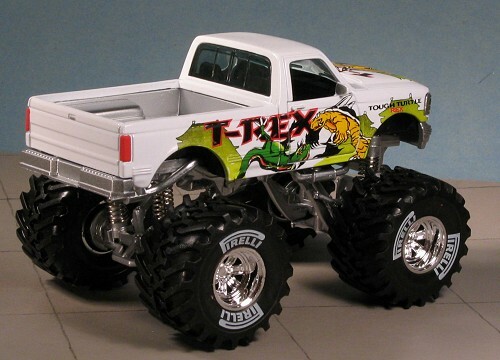 The body is pre-painted in white with the T-Rex decals already on it. However, there is still a bit of room for improvement. What I did was to paint the tail lights red and black out the grille. I used Vallejo acrylics for this. I also painted the back of the mirrors and the handle for the tailgate with ModelMaster Aluminum. Nothing major, nothing complicated and about 10 more minutes of fussing with the truck. Well I have to say, that if you want quick and easy, and you still want to consider it model building, I guess this would be the way to go. It offers zero problems, fit is as you'd expect and in the end, you do get a very nice display piece. It is also something that seems like it could handle some rough play, and perhaps that is where it would get its most use. For youngsters, this is undoubtedly something they'd enjoy. For experienced modelers such as myself, I found it an interesting exercise, but something that left me feeling as if I'd not really accomplished much. As a note, I believe that I got the tires on backwards. At least I get several e-mails after this was first published informing me of that and do not remember if I rephotographed the model or not. Kit courtesy of the IPMS Butch O'Hare raffle.